Whereto For US Bond Rates? The recent sell-off in mid- to long-dated Treasuries accelerated this past week. Robust economic data and a repricing of the market's expectations for future interest rate hikes by the Federal Reserve (Fed) are behind the pronounced uptick in yields. The yield on the 10-year note hit 3.23% by 1pm on Friday 5 October, 17 basis points (bps) higher for the week and up 37bps from the end of August. Similarly, the yield on the 30-year bond climbed 19bps in the last five days and 38bps in the last five weeks. Up until now, modest increases in bond yields were based on confidence that the economy would eventually show sustained strength. The data are now validating this optimism. In September, the Institute for Supply Management (ISM) Non-manufacturing Purchasing Managers’ Index (PMI) rose to 61.6, its highest level in the current economic expansion and indicating an acceleration of growth in the US services sector. 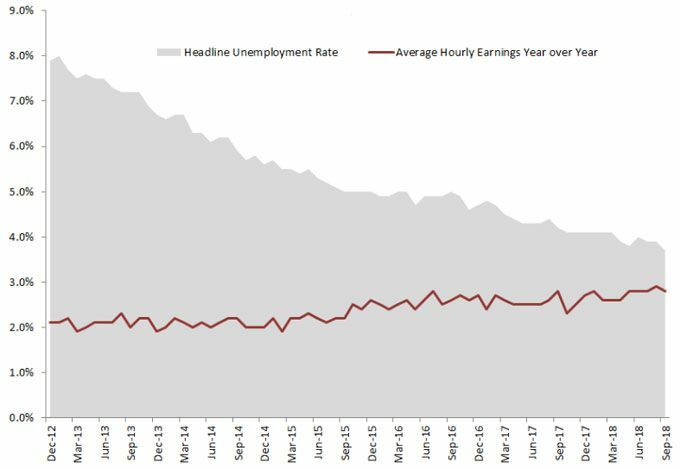 Although nonfarm payrolls fell short of expectations for the same period, wages continued their recent strength, rising at a 2.8% year-over-year clip. The headline unemployment rate also fell to 3.7%, its lowest level since 1969. These data caught investors’ attention as the combination of a strengthening services sector and solid wage growth may have ramifications for the US inflationary outlook. Services comprise roughly 80% of the US economy, and wages – the main expense for services companies – pose a potentially powerful catalyst for broader inflationary pressure. Expectations for the forward path of the federal funds rate, as measured by market-implied pricing, jumped amid the healthy economic outlook and the possibility of a breakout in inflation. This move had a significant impact on rates across the yield curve. 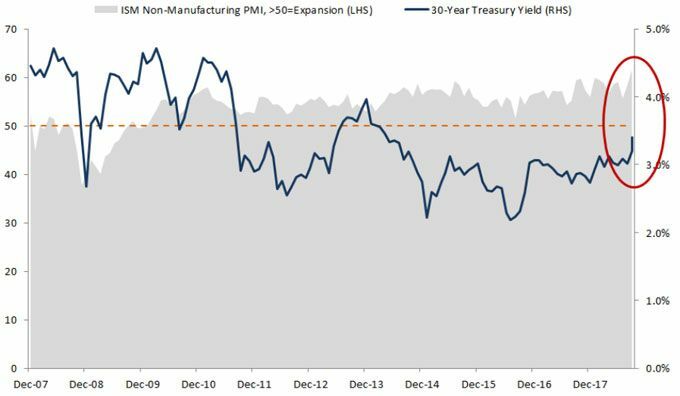 We have expected upward pressure on Treasury yields for some time and believe that the current repricing may still have room to run. Clearly, the primary driver is continuing economic strength in the US, borne out not only by the services PMI and employment picture, but also bullish sentiment among small businesses amid deregulation and tax reform. Bond market fundamentals are also starting to impact Treasury prices. In recent years, yield differentials between the US and the rest of the developed world pushed foreign buyers toward the relative attractiveness of US government bonds, keeping a natural lid on yields. However, a rise in hedging cost – due to Fed rate hikes – is pushing returns for many foreign buyers into negative territory, sapping demand for Treasuries. Furthermore, the supply of Treasuries looks set to rise as a result of increased government spending and a shortfall in tax revenues, all of which could lift yields. It should also be noted that inflationary pressures have yet to materialise; should inflation break out of its current 2% range, the bond sell-off could hasten. This week’s moves mainly reflect the macroeconomic picture and supply/demand fundamentals of the bond market. Absent is the role bonds typically play as a safe haven for investors. Should frothy equity markets experience a pronounced sell-off, or trade disputes and geopolitical events finally weigh more broadly on risk sentiment, the pace of yield increases could slow or even reverse. [See note above – Ed] But for now, investor exuberance remains. Since the Fed initiated its most recent tightening cycle in 2015, much of the action in Treasuries has been along the front end of the curve. We believe that over the next several months shorter- to mid-term yields are likely to rise. Despite the market’s recent repricing of Fed expectations, it is our view that the market is still substantially underestimating the Fed’s resolve to continue incrementally raising rates over the next few years. Consequently, we think the yield curve could once again flatten as the market plays catch up to the Fed’s trajectory. Indeed, a repricing along the shorter end of the curve, in our view, could be even more drastic than what was just experienced at the long end. Overall, this reflects the broad market consensus that the US is not an attractive source of duration at present.